The Faint is an American indie rock band. Formed in Omaha, Nebraska, the band consists of Todd Fink, Jacob Thiele, Dapose, Joel Petersen and Clark Baechle. The Faint was originally known as Norman Bailer and included Conor Oberst (of Bright Eyes, with whom the Faint toured in 2005). He quit shortly after the band was formed, though the Faint continued to share a spot with Bright Eyes on Saddle Creek Records. Growing up, Fink, Petersen, and Baechle skateboarded in their free time until Fink developed knee problems, which shifted their hobbies towards making music. The band originally consisted of Clark Baechle, Todd Fink (formerly Todd Baechle), and Joel Petersen. They signed to Saddle Creek Records and released a few singles, but were unable to establish widespread sales. After adding Matt Bowen, the Faint released Media. At the end of 1998 Jacob Thiele joined the band, and shortly thereafter Matt Bowen was replaced by Ethan Jones. They toured the US playing what would become the songs that would comprise the next album, Blank-Wave Arcade which had a more dance and techno influenced sound and was an underground hit. Before recording the album however, Jones left the band and was replaced on bass guitar by Joel Petersen, who played both bass and guitar on the album. Partway through the creation of Danse Macabre, the Faint added Dapose, a death metal guitarist formerly of LEAD. Their next album, recorded with Mike Mogis and released in 2004, was called Wet from Birth. 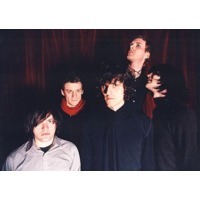 In May 2008, the Faint announced that they had split from Saddle Creek and that their fifth studio album would be self released under their own blank.wav imprint. The album, entitled Fasciinatiion, was released on August 5, 2008 in the U.S. The first single from the album is "The Geeks Were Right" which was released on Boys Noize Records. It was also announced that the band would tour North America with British electronic group Ladytron during the spring. Their song "Mirror Error" was also featured on season two of US television drama Gossip Girl, and other songs of theirs have also been featured in episodes of CSI: New York. Also, song "Worked Up So Sexual" is featured on The Office season 4, episode "Night Out," played in the background of a club, and the song "Drop Kick The Punks" was heard in the background of the season 2 episode of The O.C. called "The SnO.C." Since the release of Fasciinatiion, three of the band members, Clark Baechle, Todd Fink and Jacob Thiele have been quietly, with little advertising, performing under the name Depressed Buttons, playing remixes of other artists, and DJing for various small clubs and venues.